Update: Version 1.3.1 is now available here. Version 1.3.0(_01) of this application has now been released and is freely available. Image To ZX Spec 1.3.0 is a multi core capable image and video converter that can produce vintage computer art images (jpeg/png) of any size and can even convert work to a real ZX Spectrum (or an emulator) as a slideshow or video. This is useful to create retro 8bit music videos, posters, tshirts, mock screenshots etc etc - you do not even need a Spectrum to use this program! New for 1.3.0 - With the exception of the first Ubuntu (15 colour) screenshot above (the tool works on Windows and Ubuntu), the other screenshots illustrate the new GigaScreen 102 colour palette option. For more images and information on Image To ZX Spec's full capabilities read here. 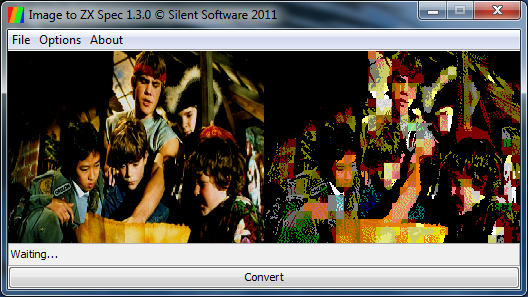 GigaScreen images are viewable on any Spectrum with a suitable GigaScreen viewer program. The large palette is a product of flashing two specially prepared images in sequence and due to persistence of vision extra colours can be seen. 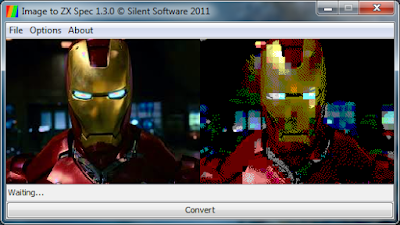 The real colours are displayed in Image To ZX Spec's preview and saved in other image file formats (png/jpeg) capable of being shown on a PC. Amazing stuff and works perfectly with SpecEmu. I like the option that you can see the result of different methods at the same time and can choose the one I like the best. Added "GigaScreen" palette mode (102 colours). Added "Reduced Set Colours" attribute favouritism. 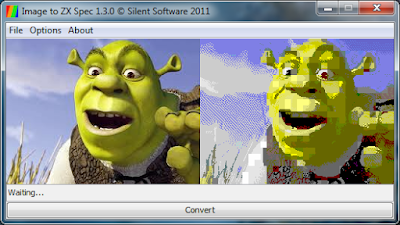 Added proportional 256x192 preview capability to the dither preview dialog. Removed lesser used tape loaders. Fixed main window size bug. Fixed missing dialog icon bug. Improved preview repaint for Java >1.6.0_2x. Updated readme and about dialog text. Image to ZX Spec 1.3.0_01 Standalone (direct download, just unzip and double click jar file to start). 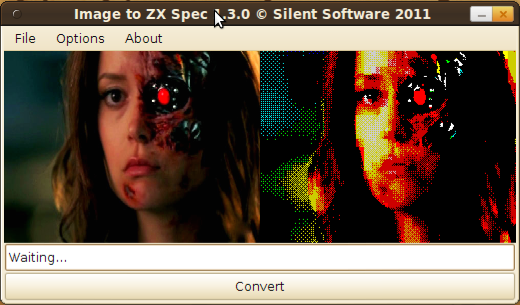 Try Image to ZX Spec 1.3.0_01 online. Image to ZX Spec 1.3.0_01 Source code and Javadoc (note GPL 2.0 licenced). Nice tool. Timex 8x1 mode support would be nice. 272 PRINT AT Y,1;"between frames (50 is 1 sec, a"
No SCREEN$ loading code is evident! Thanks for letting me know - you are correct the basic source I've used has a wrong line number error in it. I'll put out a 1.3.0_01 build tonight to fix it. I don't have OSX to test on although I am currently working on a bug fix version of 1.3.0 (Ubuntu drag and drop fix, simple tap loader problem above...). If you're prepared to test a few builds for me I might be able to fix the problem? One more thing (although this may sound obvious) - please ensure you have an output option chosen in the "Misc Options" tab under the Preferences.